Looking for a Farsi / Persian translator ? Looking for a Farsi Translator ? Well, Congratulations! You found the best possible Farsi Translator online. 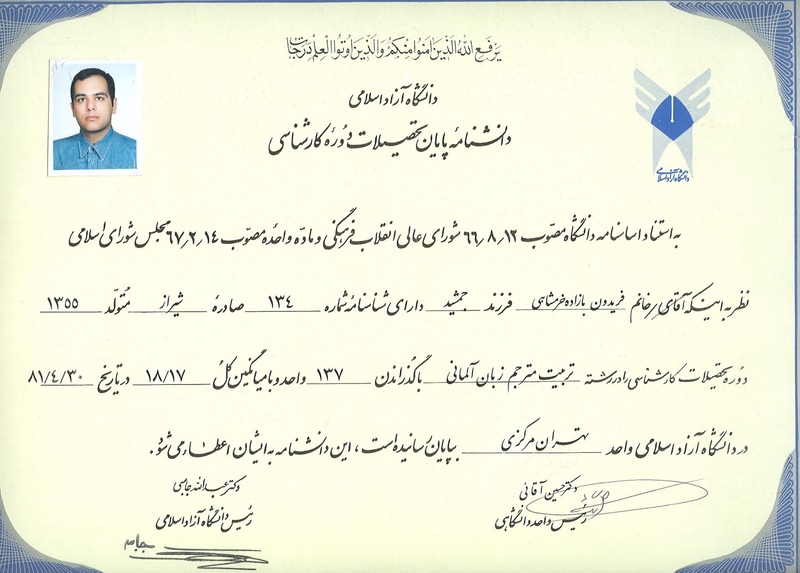 My name is Fereydoon Bazadeh Khorramshahi and I have been working as a Freelance Translator for the past 15 years. I earned a bachelors degree in German Language ( Übersetzung von der deutschen Sprache ) from Tehran Azad University, and got my ÖSD1 and ÖSD2 certifcates ( Österreichishes Sprachdiplom Deutsch ) from the Cultural Section of the Austrian embassy in Tehran, Iran ( Österreichisches Kulturforum Teheran ) . I have Studied English from ..Read More. What Language Pairs and directions ? Contact me to get the best quotation and turn-around time. How different am I from other Farsi Translators ? I am doing researches on different subjects and try to chose the best vocabulary for the translation job I am doing specifically. If there is not such a word I will crosscheck multiple references and will try to ask experts about the subject matter. I do speak an older version of Farsi / Persian that is spoken by Iranian Zoroastrians and that language is some sort of making me to choose purer Farsi words rather than using Arabic loan words, which is the tendency of many translators. 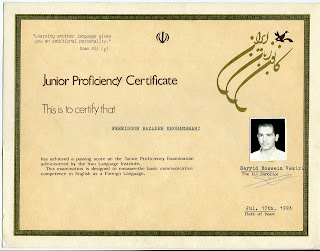 Do I offer certified / legal text translations to and from Farsi? The answer is No. I would love to do that, but the problem is that ATA ( American Translators Association ) does not offer tests for Farsi / Persian Language. As a Farsi Translator, I offer freelance translation for webpages, catalogs, brochures, technical manuals, webpages, books and etc. There has always been a debate on how to use the term, when referring to the language spoken in Iran, Tajikistan and Afghanistan. I have gathered 4 articles that pop up first on Google, when you type in “Farsi or Persian” . I also have added a page here to discuss the matter and add my own opinion. You can download a PDF format of the file from Here or go direct to the page and download it from the link from the bottom of the page. To receive a quotation, please send the text in PDF, MS Word, MS Excel to the above-mentioned email address and I will guarantee to reply back with a tailored quotation in less than 8 hours. I live in San Diego California, then please if you are calling from Europe, East coast or etc., please take this into consideration. You can simply know the time using Google. 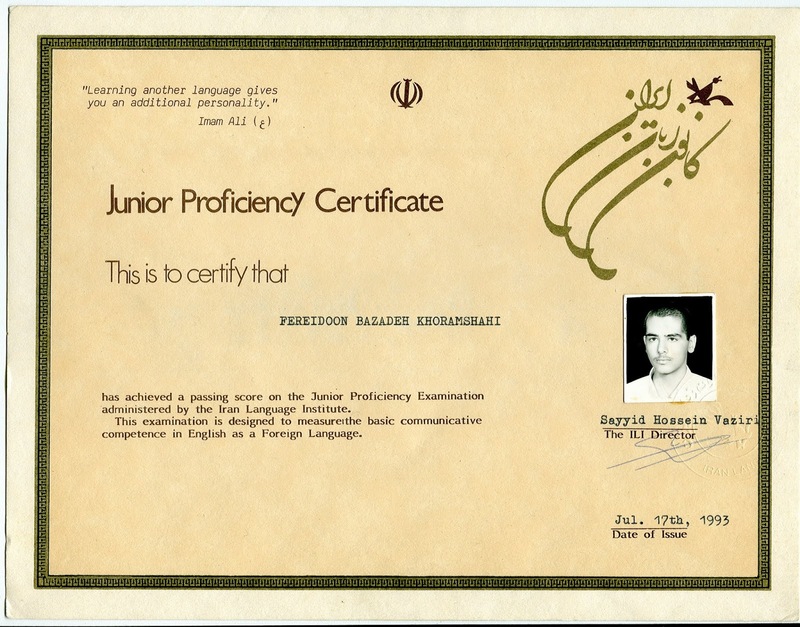 I am multilingual, fluent in English, Farsi and German, both written and verbal. I also know a little bit of Arabic, Spanish and French. I am skilled at providing translation services for a variety of individuals and organizations, helping them to attain their objectives, expand their market internationally and adhere to local regulations and document requirements. In addition to simply translating the information provided me, I strive to completely understand my client’s needs and the subject matter I’m working on to impart the appropriate cultural nuances into the finished product. I’m skilled in the Microsoft Office Suite and internet publishing products and technologies. Provided individual and group transportation to residents and visitors throughout the Southern California Area. · Helped foreign visitors navigate throughout San Diego and surrounding areas, providing both transportation and interpretation services, thereby helping to enhance their experience. · Became familiar with the fastest routes, local attractions and other entertainment and dining venues of interest to visitors to the area. · Maintained a perfect driving record during this period. Worked on a team involved with the construction of the Tehran International Tower, which is a 56-story building in Tehran, and is the tallest residential building in Iran. · Helped the company win the bid to procure and provide drywalls and suspended ceilings for this multi-million-dollar project. · Coordinated activity with international suppliers from all over the globe to procure the building materials. Suppliers included companies from Knauf, Great Britain, and the Philippines. · Assisted with translation activities during conference calls and working with project related documents. Hello and welcome to read this paper on the correct use of Farsi or Persian, when referring to the language spoken in Iran, Afghanistan and Tajikistan. · finally, the fourth one from Kamran Talattof. The very first thing, I would like to discuss about in this paper, to shed more light to the usage of these two words would be, the meanings of Exonym and Endonym, which are discussed about in none of these articles. An exonym or xenonym is an external name for a geographical place, group of people, or language/dialect: a common name used only outside the place, group or linguistic community in question, usually for historical reasons. An endonym or autonym, on the other hand, from the Greek root words ἔνδον, éndon, "within" or αὐτο-, auto-, "self" and ὄνομα, ónoma, "name", is given by members of a particular ethnolinguistic group to the group itself, its language or dialect, or its homeland or a specific place within it. So if Americans, Britons and many other English speaking nations would like to use and an endonym, they might. It is nobody’s fault and more than OK, if they use “Tagalog” instead of the standardized register “Filipino”, as far as everyone understands, what the whole text or discussion is all about. We cannot set limits to the usage of the words and vocabularies used. I. Persian is made of Perse+ian. Better to say the Latinized root of a geographical name, or an ethnicity, which was originally Parse and a completely European suffix at the end of the word. II. Farsi is combined of these two words: Fars+i . The first part is the Arabicized of the term “Pars”, which is definitely, a geographical name. But the last portion is definitely a hundred percent, Iranian suffix, that we still use in our contemporary Persian / Farsi. And this suffix will show the relation of something to another thing, like an ethnicity or a vernacular language and etc. So, it has more Farsi / Persian elements in it. But just to mention it here, I am not against using any of the two terms. that you can switch it with the endonym of that language and make comparisons. They are either showing the relationship of that object with an ethnicity or a local/geographical name. That is what raises from poor judgement. · The one from Kamran Talattof, -if you read through the whole materials from Shapour Souren-Pahlav-, has nothing in it. It is a shortened copy of the third addendum. · The very first article from Mr./s. Kamali has does not include any grounds and reasons and he has come up with the idea of, creating a middle ground and this type of article has no scientific values. · The article that is very worked on is the 3rd one from Shapour Souren-Pahav and this could be obviously said from the number of pages and sources mentioned in bibliography. Conclusion: The main role of a language is to understand and make yourself understandable. If the group of people you are talking to/discussing with/ writing to, can understand you, it is definitely OK to use it. It is not an INSULT, as mentioned in the third article. Persian (/ˈpɜːrʒən, -ʃən/), also known by its endonym Farsi (فارسی fārsi [fɒːɾˈsiː] ( listen)), is one of the Western Iranian languages within the Indo-Iranian branch of the Indo-European language family. It is primarily spoken in Iran, Afghanistan (officially known as Dari since 1958), and Tajikistan (officially known as Tajiki since the Soviet era), Uzbekistan and some other regions which historically were Persianate societies and considered part of Greater Iran. It is written right to left in the Persian alphabet, a modified variant of the Arabic script, which itself evolved from the Aramaic alphabet. Persian has had a considerable (mainly lexical) influence on neighboring languages, particularly the Turkic languages in Central Asia, Caucasus, and Anatolia, neighboring Iranian languages, as well as Armenian, Georgian, and Indo-Aryan languages, especially Urdu (a register of Hindustani). It also exerted some influence on Arabic, particularly Bahrani Arabic, while borrowing much vocabulary from it after the Arab conquest of Iran.